It's often said that people fear what they don't understand, and that certainly seems to be true in the case of snakes, especially venomous species. For centuries, they've suffered under misinformed persecution by humans. That's why getting to know these animals better is key to protecting them – and scientists like William Brown are willing to venture into the snake's den (literally!) to accomplish that. Every year for almost four decades, Brown has been visiting timber rattlesnakes in the Adirondack Mountains of New York. It might not sound like the most glamorous past-time, but the Skidmore College researcher says the work has been worth it. "It's been a joyful and rewarding experience visiting my study sites again and again." A timelapse video from the New York Department of Environmental Conservation shows timber rattlesnakes around a den site in Bath, New York. The rattlesnakes gather in dens to wait out the winter each year, and emerge with the arrival of warmer weather, which is when Brown would pay them a visit. Getting up close and personal with female rattlers near the denning areas, he'd look for answers to questions about their reproduction. How old were first-time mothers? How often did they give birth? How many young did they have? In the end, his research revealed that when it comes to reproduction, these snakes take their time. On average, females didn't give birth until the age of nine or ten, and then they waited three or four more years before giving birth again, sometimes longer. This means a snake would be 14 or 15 years old by the time she had given birth just twice, although most of the snakes didn't survive that long. "[M]any females were not seen after their first (and only) gravid year, indicating that they did not survive to give birth a second time," Brown says. "This was the case for about 60% of the snakes that I studied." With each snake birthing an average of seven or eight babies, this is a particularly low reproductive rate. But not all of the snakes died young. Some lived for many years, even decades, and reproduced numerous times. "I came to know some of them individually, especially if I had caught them three or four times or more," Brown recalls. "Once I noted their mark number, I was often able to recognise them individually by memory." But life isn't easy for these longer-lived mothers. Brown's study reveals that a timber rattler in New York generally needs to survive ten years before she can have her small clutch of babies. This is easier said than done in a human-dominated landscape, especially when many of those humans want you dead. Wow. 36-yr study of NY Timber Rattlesnakes shows they don't reproduce until 10 yrs old & most reproduce only once: https://t.co/BW3wZEMaGT. Rattlesnakes don't just have to deal with habitat loss and other environmental threats – they're often killed by people outright, for monetary gain or out of fear, and sometimes for no reason at all. In fact, as recently as four decades ago, bounties were paid for dead rattlesnakes in New York, and states in the southeastern US participate in mass-slaughter festivals called "rattlesnake roundups" to this day. Snake biologist David Steen notes that slow-reproducing species are particularly vulnerable since they have a hard time recovering from even small losses to the population. "[T]hey just don't produce enough babies for populations to rebound quickly." Much of this snake persecution stems from misconceptions about these animals, especially potentially dangerous species. In fact, unprovoked snake bites are extremely rare, and these reptiles are vital for healthy ecosystems. Without these mid-level predators, who prey upon smaller animals and feed larger ones, an ecosystem can easily fall out of balance. And that's no good for anyone, not even humans. 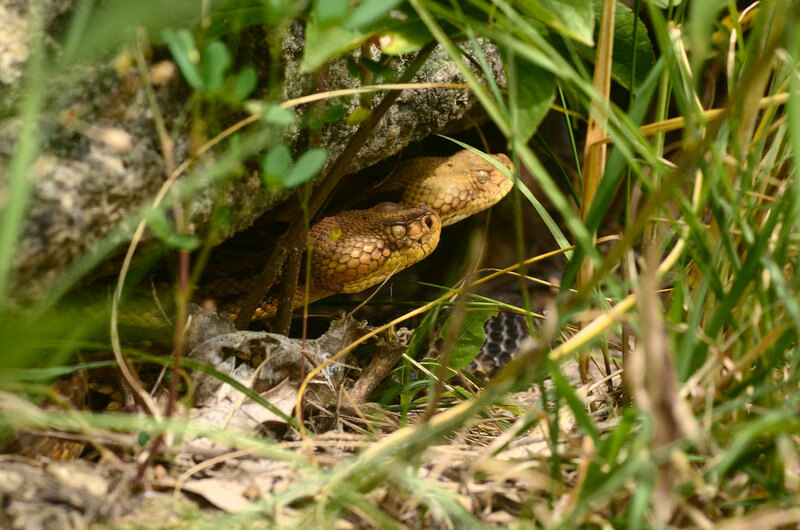 For these reasons, preserving snake dens is essential, and studies like Brown's provide crucial information to guide legal safeguards for these animals. In some states, the dens are legally protected, and two of the three timber rattlesnake Conservation Actions listed by the IUCN involve protecting them (the third action is public education). "We can't conserve what we don't understand," emphasises Steen. "And knowledge about a species' reproductive biology can help us determine appropriate conservation action." But one of the biggest hurdles to rattlesnake conservation is gaining public support. When the Massachusetts government planned to establish a colony of endangered timber rattlesnakes on an uninhabited nearby island, they received massive public opposition, fuelled largely by fear and misunderstanding. Some opponents were worried the snakes would "breed like rabbits" and move into residential areas. "From the snakes' point of view, other than having to defend themselves (if forced to) against human intruders into their range, timber rattlesnakes couldn't care less about humans," Brown notes. "Ninety-nine percent of their million-year history as a species has taken place in the complete absence of humans." But now that our species live alongside each other, it's our responsibility to ensure that million-year history continues. Could 'smelly' snails ward off a major Great Barrier Reef enemy? The crown-of-thorns starfish is a major threat to the Great Barrier Reef. But scientists think they've discovered its weakness. A new report has revealed the disease is popping up in far more places – and in more snake species – than we thought.